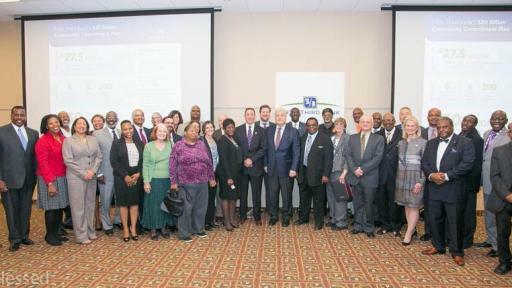 Today, Fifth Third Bancorp and the National Community Reinvestment Coalition (NCRC) signed a landmark $30 billion community development plan through 2020. 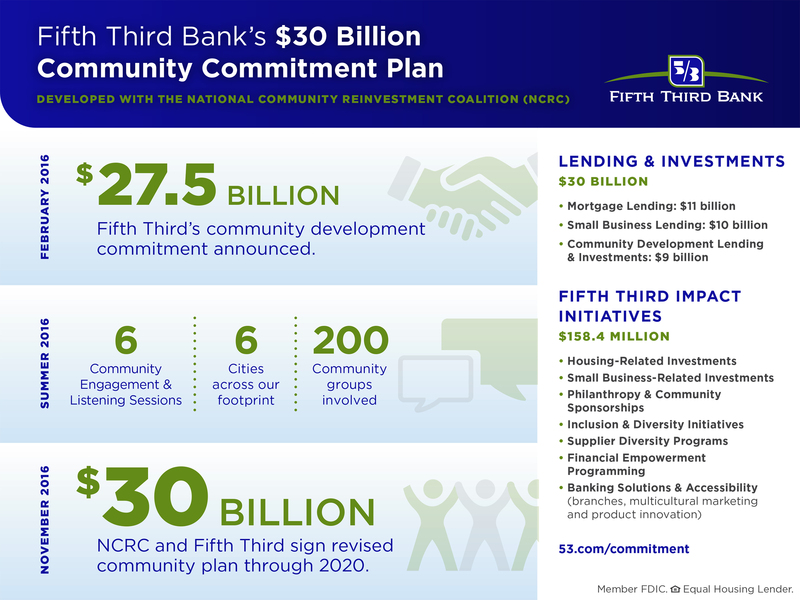 The plan builds on the $27.5 billion community commitment that Fifth Third announced in February 2016, and is the largest by a single bank in recent history. A detailed summary of the agreement can be accessed at www.53.com/commitment. 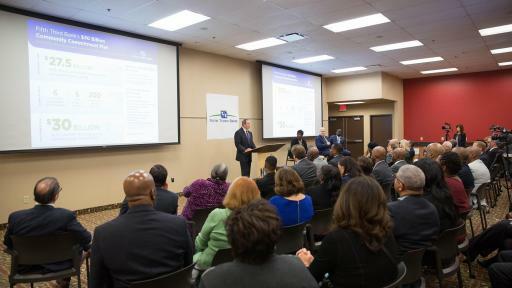 The plan covers the 10 states in which Fifth Third has branches and follows weeks of discussions and six meetings between Fifth Third and community groups working with NCRC in Chicago, Charlotte, Cincinnati, Cleveland, Tampa Bay, and Washington, D.C. All told, Fifth Third met with more than 200 community-based organizations. 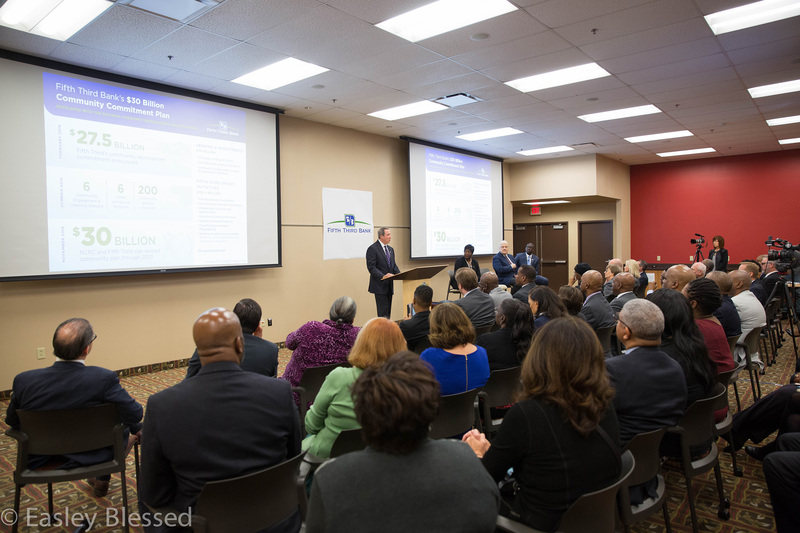 The plan calls for Fifth Third to invest $30 billion in its communities over a five year period, which began January 1, 2016. Lending and investments of $30 billion covered under this agreement include the following categories: mortgage lending, small business lending, including micro-lending; and community development lending and investing. The agreement also covers $158.4 million in community initiatives, including financial services, branch openings, marketing and research, product development and cooperative public policy advocacy for low- and moderate-income (LMI) communities. Fifth Third increased its overall goal for mortgage lending to LMI borrowers and census tracts, and added a home purchase sub-goal. The commitment includes product innovation to address community needs, and includes a Second Look Program, down payment assistance, support for housing counseling, and other activities, including affirmative marketing and outreach, evaluation and improvement of its Fair Housing/Lending program, and the continuation of its current policy of not imposing minimum loan amounts. Fifth Third is committed to improving its lending to small businesses with gross annual revenue below a million in all markets and communities. The commitment includes increased support for small businesses, product innovation, and enhanced underwriting and fulfillment. Fifth Third will strive to achieve peer-leading performance in the amount of combined community development loans and investments (CDLI) over the course of the five-year commitment. Increases in CDLI activities will be supported by initiatives in affordable housing, a revolving loan fund, community development corporations, community development financial institutions, community pre-development resources, housing rehab loan pools and land banks. 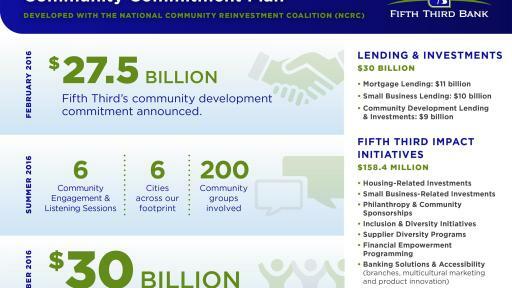 The Fifth Third Community Development Corporation will also make $1 billion in tax credit investments. Fifth Third Impact Programming includes: Housing-Related Investments, Small Business-Related Investments, Philanthropy & Community Sponsorships, Diverse Hiring, Supplier Diversity, Financial Empowerment Programming, Services and Basic Banking, including branches and staffing, and other investments and marketing. Fifth Third will make housing-related investments that address the gap for consumers who need down payment assistance to achieve homeownership, support housing counseling and financial literacy to help families and individuals achieve their long-term financial goals, and help fund housing loan pools for minor home repairs or gap financing to support neighborhood revitalization. 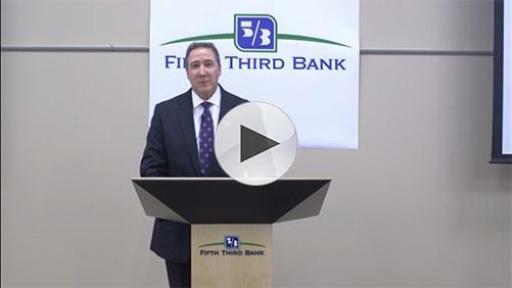 Fifth Third Bank will also make small business-related investments that provide technical assistance for small business development and growth, and support the ecosystem for small business lending. The Bank will strengthen communities through significant philanthropic grants and donations and impactful community sponsorships. Charitable giving will include a focus on providing organizations with resources for capacity building, workforce training, and assistance for older adults. The Fifth Third Impact programming includes branch and staff commitments. Fifth Third will seek to open at least 10 more branches in LMI and/or high minority communities. 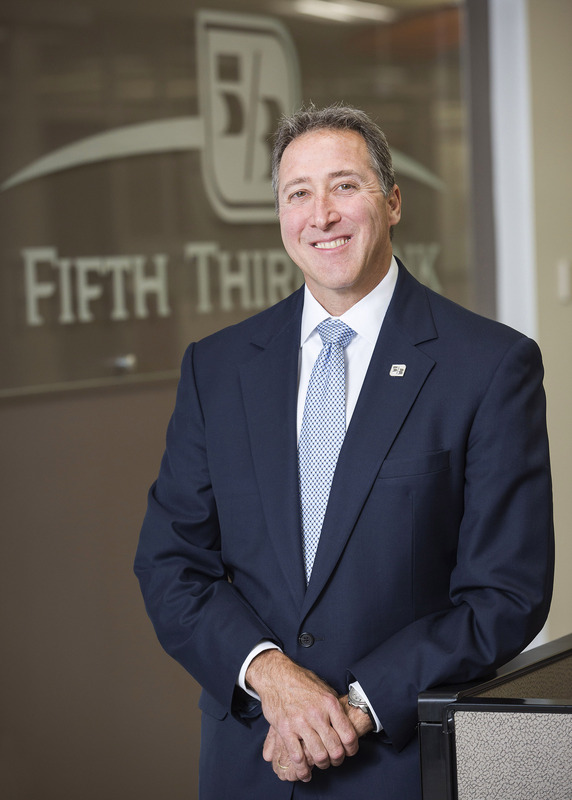 Fifth Third will establish the position of Senior CRA Mortgage Lender, and continue to retain and hire mortgage loan originators focused on CRA success. It will expand small business staffing with a newly-created role for CRA Small Business lenders. Fifth Third’s Inclusion and Diversity plan supports the Bank’s commitment to ensure that its human capital is inclusive and diverse. The Bank will increase its efforts to support diverse suppliers, minority-owned, women-owned and veteran-owned businesses. Fifth Third Impact programming also includes the delivery of Fifth Third’s L.I.F.E. (Lives Improved through Financial Empowerment®) programs, which strive to reach consumers at every age and stage of life through foundational financial education. These programs include, but are not limited to programs for children and teens, including the Fifth Third Bank Young Bankers Club®, and programs for adults like Fifth Third Bank Empower U® adult financial education courses. Fifth Third’s L.I.F.E. programs also include the Company’s Financial Empowerment Mobiles, or eBuses, which deliver financial education, job training, tax preparation and other assistance directly to low- and moderate-income communities on their own and in partnership with local community organizations. 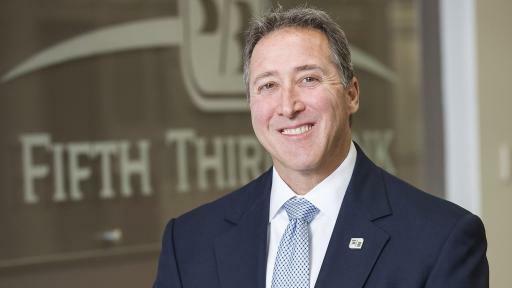 “NHS of Greater Cleveland welcomes the opportunity to continue our partnership with Fifth Third Bank to implement this broad-reaching plan that will positively affect the residents and the communities we serve in northeast Ohio,” said Lou Tisler, executive director, Neighborhood Housing Services of Greater Cleveland.